Mt America Elk Jerky is a gourmet jerky, handmade in small batches every day, this jerky is always fresh! Elk is always a best seller! Elk is lean, yet tender. It is raised free range and is free of added hormones or antibiotics. Gluten Free. 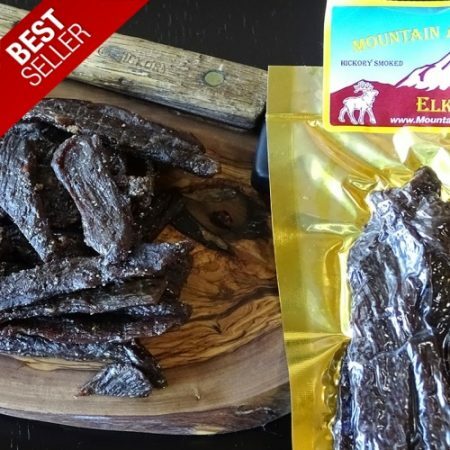 Mt America Elk Jerky is hand made in Colorado. It is natural hickory smoked; Gluten Free; no preservatives; no MSG; no nitrites. Ingredients: Elk, Tamari soy sauce, brown sugar, salt, garlic, onion, spices. 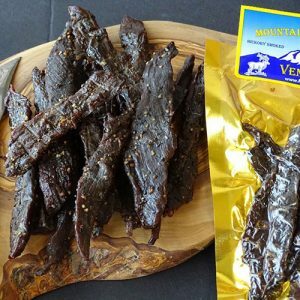 Mt America Venison Jerky is made from animals raised with no growth hormones or steroids. A thicker yet chewy cut of buffalo jerky is high in protein, low cholesterol, low fat, and delicious! Venison is lean, naturally tender, and darker than beef. Free-range and free of added hormones or antibiotics. It has extremely low levels of fat and cholesterol and high levels of omega 3 fatty acids. 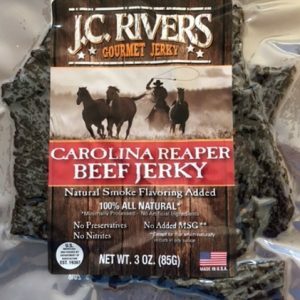 JC Rivers Carolina Reaper Beef Jerky is a small batch jerky handmade from thin slab cuts of top round. These large slabs are easy to tear and chew. This is the hottest jerky we carry. A classic jerky infused with seething heat from fresh Carolina Reaper peppers. Providing a burn that can last for 20 minutes or longer, this jerky is perfect for those that love the spiciest food imaginable. 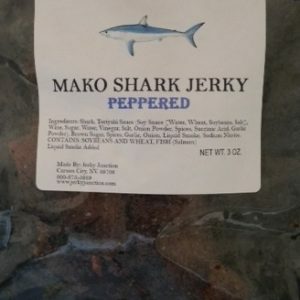 Flavor – smoky and mildly peppered, a rich flavorful fish jerky! We made this jerky for Steak Lovers! Do you like eating a juicy steak seasoned simply with salt and pepper? 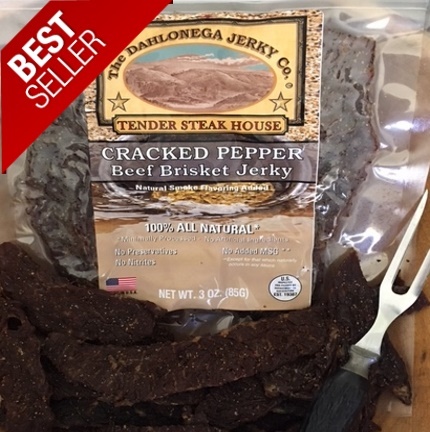 Then Dahlonega Jerky Co. Tender Steakhouse Cracked Pepper Brisket Jerky will satisfy your craving! Flavor – first you’ll taste savory hickory flavored beef, followed by salt and cracked black pepper. Meat cut – handcrafted thick slices of beef brisket. Chewing texture – soft, tender meaty chew jerky. Mt America Kangaroo Jerky is a gourmet jerky, handmade in small batches every day, this jerky is always fresh! Flavor – a hickory smoked jerky seasoned with salt and black pepper. Kangaroo has a light sweetness to the meat with a very mild game taste.